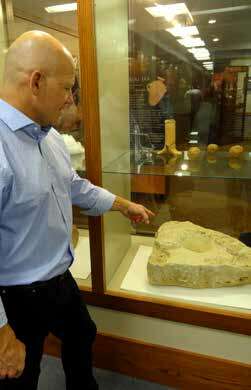 Visitors to Southwest Baptist University can now see about 50 artifacts unearthed in Israel, Jordan and Syria. The free exhibit, “Khirbet el-Maqatir — A Journey through Biblical History,” will run through Dec. 8. The exhibit focuses on artifacts discovered at a site that may contain the ruins of the city of Ai mentioned in the biblical book of Joshua (chapters 7-8). It may also be the site of a later settlement known in John 11:54 as Ephraim during the time of Jesus, just nine miles from Jerusalem. Scott Stripling points to a large socket stone for the city gate. (Photo: Brian Kaylor)Scott Stripling, provost at The Bible Seminary in Katy, Texas, and the director of excavations for the Associates for Biblical Research at Khirbet el-Maqatir and Shiloh, Israel, led the teams that found the artifacts in the exhibit. He launched the opening of the exhibit during a symposium at SBU on Feb. 24. A Herodian oil lamp from 37 B.C. – 70 A.D. (Photo: Brian Kaylor)During the symposium, Stripling offered two lectures about the site and then led tours of the exhibit. In his first lecture, he made the case for why the site should be considered the location of Ai, an important city in the biblical conquest narrative. Stripling’s argument that Khirbet el-Maqatir is the site of Ai challenges longheld scholarship, but he continues to make his case. 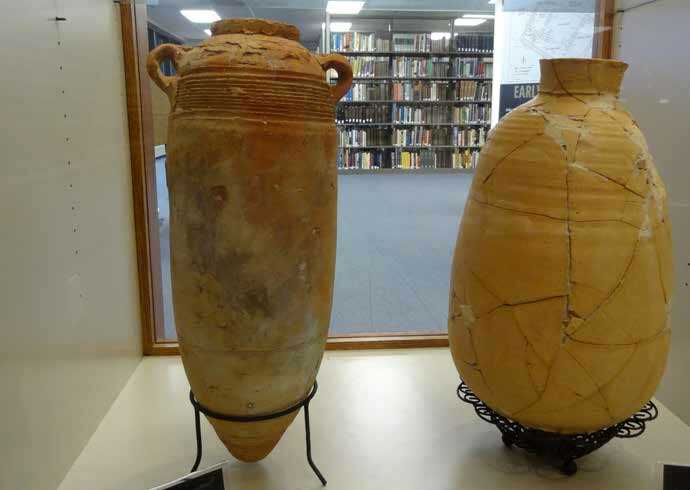 Two pottery jars with books in the SBU library in the background. The one on the left is from 100-400 A.D. 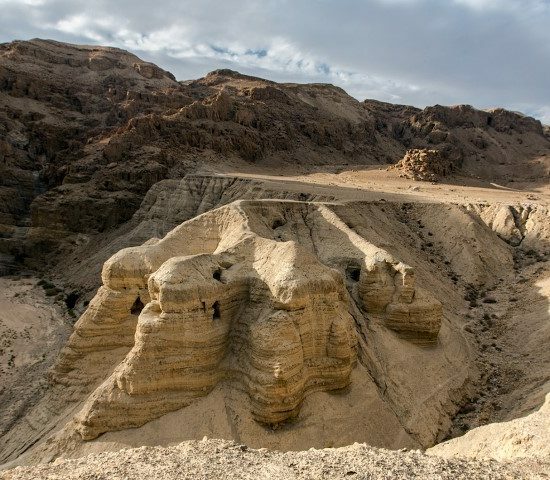 The one of the right is from the 1st century A.D. (Photo: Brian Kaylor)He explained why he believed other sites did not fit biblical descriptions and why what his teams have found at Khirbet el-Maqatir do fit. He noted several textual clues regarding Ai’s location: near Beth- Aven, near and east of Bethel, east of an ambush site and south of a valley and ridge. He also listed several archaeological characteristics that fit what should be found at the ruins of Ai, including that it was inhabited at the time of the conquest with a fortification system, that it had a northern gate, that it was smaller than Gibeon and Jericho and that it was destroyed in a fire. In his second lecture, Stripling talked about the remains of seven women and one boy his team found that had been slaughtered by Roman soldiers while hiding in a cave. He believes they died in 69 A.D. amidst an uprising against the Romans that eventually ended with the destruction of the nearby Temple the following year. If the town is Ephraim, where Jesus spent part of the last week before the crucifixion, Stripling said, then the eldest of the women slaughtered in the cave may have even met Jesus. 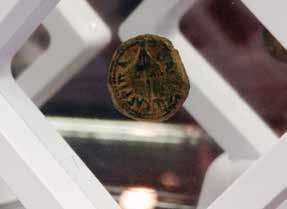 Bronze coin issued by Herod Agrippa I in 41/42 A.D. (Photo: Brian Kaylor)Among the artifacts from the digs at Khirbet el-Maqatir at the SBU exhibit are pottery vessels, coins, oil lamps, scarabs, seal impressions, slingstones and city gate door sockets. A key item in the exhibit is an Egyptian scarab from 1450 B.C. featuring a falcon-headed sphinx, which Christianity Today called the top biblical archaeological discovery in 2013. Located in the Joyce Sells Heritage Center of the Harriet K. Hutchens Library on SBU’s campus, the exhibit will be open Mondays – Saturdays 9 a.m. to 5 p.m. (except on holidays). For more information, contact Bing Bayer, professor of theology, Old Testament and Hebrew, at (417) 328- 1765 or bbayer@SBUniv.edu.